Unique Moments Photography of Gig Harbor Washington captured this image at the reception when all the wild and crazy moments often occur. 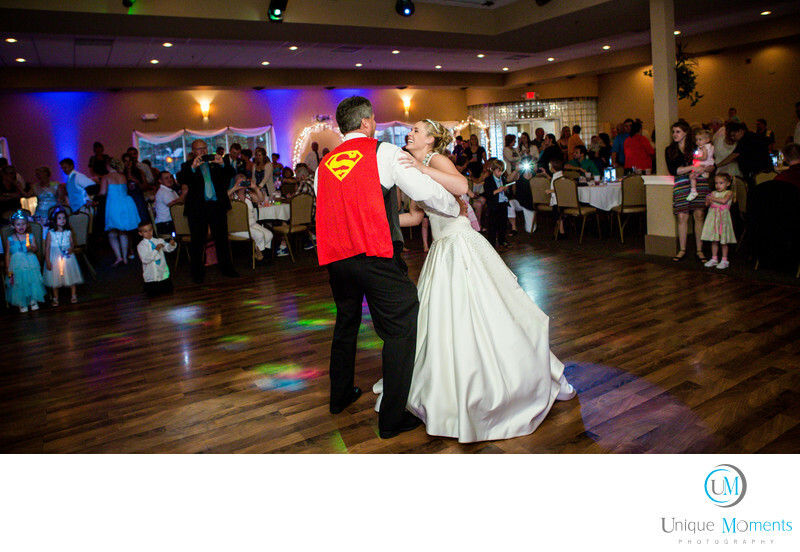 Superman (her Father) visited the dance floor and showed up with his cape. She had no clue. Obviously a great moment and this image is in the album. We used off camera flash and our cameras can handle very dark reception venues easily. It was super dark in this room but you would never know it. Make sure your photographer has cameras that can handle dark rooms and he/she is proficient with a flash. There is no other way to capture images like this. ISO readings were 10,000 iso for this image. This is a straight off the camera picture. Our cameras handle dark Rooms with ease. We stay well into your receptions so that all the wild and crazy moments are captured.